We should move to Oregon. Stephen Malkmus said so. So I’m moving down the street from his home. It would be nice to be around someone who isn’t all that phased about things like equipment malfunctioning on stage. 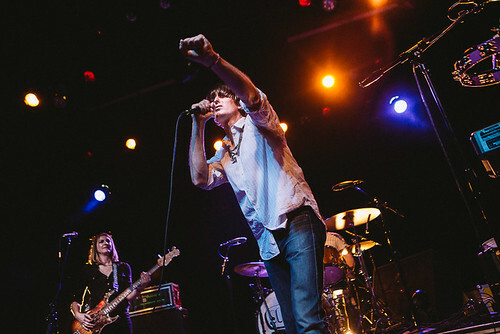 Although Malkmus can’t do the Nick Cave praying mantis, he was able to maneuver around mic and guitar cables throughout the night. Malkmus flowed with whatever snafus came up and just used it as the band played new tunes from Wig Out at Jagbags. The “sassiest boy” Mike Clark, was having way too much fun between keys and guitar as bassist Joanna Bolme and new drummer Jake Morris kept the rhythms pulsating throughout the set. SM&TJ appears to have great bands opening up for them. Last time around, Ty Segall had that spot. This time, people were there early to catch Massachusetts’ Speedy Ortiz. Sports fans would appreciate the band as they sang songs about basketball and playing sports indoors.